A Shi...pload Of Polish! : Do You Wanna Fanta? Squeep!!!!! Two of my favourite colours in one, definitely going to be well used during the next couple of months! Might need to buy a back up! Let's start with saying, I freakin' love this f'ing polish!!!!! I love that it seamlessly goes from one of my favourite colours to another! This is definitely going to be my go to polish this summer, the effect is so simple and only takes two coats for results. Do You Wanna Fanta? was fully opaque with the two coats, and dried quickly. It applied really nicely for saying it was a thermal-which are usually on the thicker side. I love the vibrant shades of pink and orange the polish switches between and that it does it seamlessly, so it looks like a great gradient has been applied. The polish has a lovely goldish purple shimmer to it that makes it look even nicer when the light catches it. You'll probably see it used again in the future, as I didn't manage to photograph this properly when I last applied it and only caught it mid change-I'd like to get it fully at each colour! 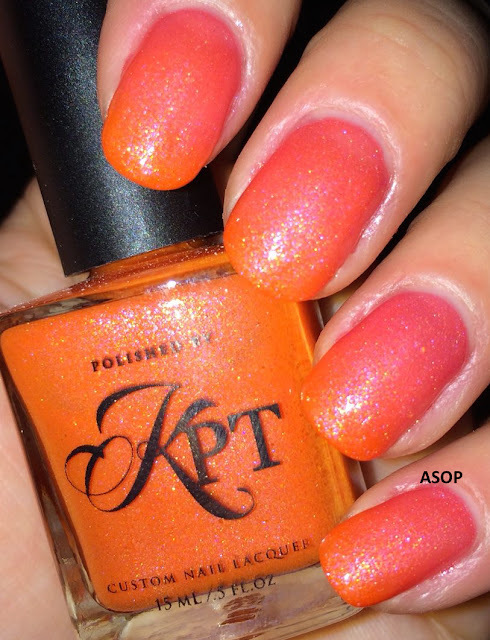 The polish is orange when cold and pink when hot. As do most thermals, it suits longer nails better as the longer tip is generally a different colour to the nail bed due to the temperature. Other bonuses of this polish are that it is Big-5-Free, Vegan, and Cruelty Free.